Want to hide developer options in Android 9 Pie? Here’s how to disable developer mode Android 9 Pie devices such as Google Pixel 3, Pixel 3 XL, Pixel 2 XL, Google Pixel, OnePlus 6T/6 etc. This developer option is use for development only. Sometimes they can cause your phone and the applications on it to break or misbehave. 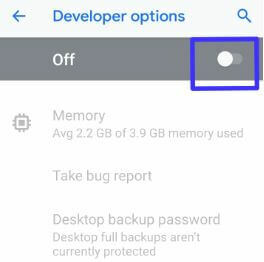 By default turn off developer options on android devices. In developer mode settings, you can enable USB debugging, OEM unlocking to allow the Bootloader to be unlocked, change logger buffer size, USB configuration, Windows animation scale, display cutout (Google Pixel devices) and more useful settings. Follow below given step by step process to disable developer mode Android 9 Pie, Oreo 8.1 and Nougat 7.1.2. Make sure turn on developer mode in your android devices. You can find developer option under system settings in your latest android Pie 9.0 devices. 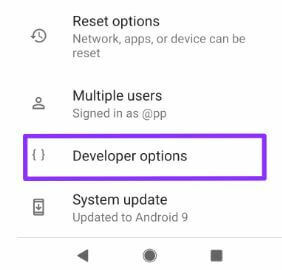 Apply below given steps to disable developer mode Android 9 Pie. You can see turned on developer options toggle in your android 9 Pie devices. Step 6: Tap back button to disable or hide developer mode in android 9 Pie, Oreo, Nougat and other devices. Now you can see developer options removed from system settings in your android Pie and other devices. If you want to again turn on developer mode, check out below given complete process in your android phone or tablet. Step 4: Scroll down up to end of the page and tap Build number 7 times or tap until appear “you are now developer!” on your android Pie 9.0 devices. Now you can use developer mode settings in your Android 9 Pie devices. And that’s all. I hope this little tip useful to disable developer mode Android 9 Pie. If you have any kind of trouble, tell us in below comment box. Stay and connect with us for latest updates.